It is Saturday morning, I look outside the window and the weather is foggy. It looks like it is going to rain but we have arranged with the volunteers to meet at the school to draw and paint the walls with educative drawings for the children. I am thinking of postponing the drawing session to another day but it is already to late, the artist and the volunteers are already on their way. We all meet at the school and we agree that despite the weather we will paint. 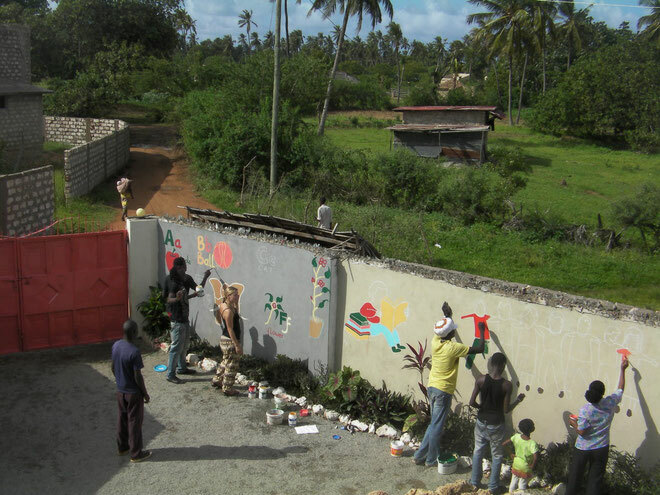 Our volunteers are the KARIBU care staff, the artist - Mansy Wako - with 3 of his friends and one other local Kenyan. The artist did not come with drawings but he brought some images of other artists to get ideas so we can create the drawings all together. The volunteer team is there eager to start working on the drawings.They all take a pen and paper and start drawing. The artist is there to correct them and show them how to draw fine lines. It is like a drawing session for everyone and even though none of the volunteers are painters they all enjoy the challenge, they bring the artist out of them and draw the best they can do. Finally the drawings are ready on a paper and we select the best ones. The artist starts copying them on the walls and in a sort time he got some of them done. Time for the volunteers to paint. Some of them are busy preparing and mixing the paint colors red, yellow, blue and some others have already started painting the walls. We managed to paint 3 drawings and the rain starts but stops in a few minutes. We go on and still the same, the rain starts and stops until it started raining properly. We are all looking at each other disappointed and we decide to postpone it to another day. At this point we all needed a tea, so we sit down all together to get to know each other better. The volunteers after drinking their tea they are about to go and this is the moment that the rain stops. We all decide to give it another try. The drawing painting session finished in the evening just as the sun was going down. Everyone was happy that we managed to get all drawings done, each of them with educative message for the children. 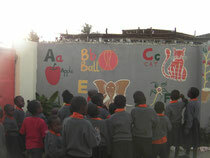 Our first wall it has multible drawings of animals, games and items combined with alphabetical letters which the kids can recognise and read. The second wall shows a kid reading maths and doing calculations such as one plus one etc. Another drawing is about friendship - 7 kids are holding each other and smiling. The next one is about sports – a girl playing football. Also a drawing about doctors – a comic doctor and his patient. Finally we created hygiene drawings - a boy washing his hands and a kid washing its hands. When the kids arrived at the school on Monday they were all so excited to see the paintings, they were trying to read from the walls the letters and reading them out loud. They even gave names to the comic kids - the kid who is washing his hand his name is Issa and the kid who is brushing his teeth is Rashid. This is what we do here at KARIBU care in Kenya, our mission is not only to relief the poverty of the children and their families but also to use our creativity, skills and ideas to educate them and pass this message to others especially the youth. We can all be active members of our communities and help each other in a creative and fun way. Many thanks to all the volunteers that joined us and help us paint our walls in a very creative way! Check out here our paintings.